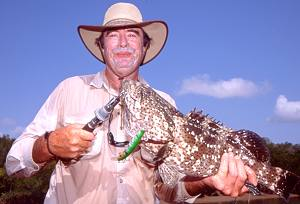 There are several cod species but the estuary cod and the Queensland groper are more commonly encountered by anglers. These fish can grow to well over 200kg. Smaller fish are very common in the estuaries and can also be found around reefs and other structure well offshore. Larger fish make their home in deeper cover such as underwater caverns, shipwrecks and beneath wharves. Larger specimens of both these fish are now rightly considered as major natural assets and are protected by law. Other Names: Epinephelus tauvina, estuary cod, cod, greasy cod. Groper: Ephinephelus lanceolatus. Queensland groper, giant groper. Location: All round the coast and in the saltwater sections of the rivers and estuaries. Method: The size and strength of these fish make them a real sporting challenge on light tackle, but they are readily dealt with on heavy hand-lines. They will eat just about any artificial or natural bait thrown at them. Eating: Smaller fish to around 10kg in both species are excellent eating. They have white, firm flesh with large flakes, little oil and a sweet flavour. However, most anglers consider it a shame to kill small Queensland groper which are not really as common as the highly-abundant estuary cod.